The cutes little paper twist doll is here at this link. You may print any patterns here with our compliments. Brand New Freebies coming soon! All the freebies here will soon be down and changed! 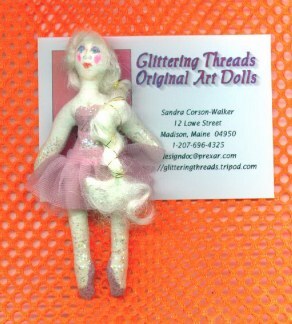 Ballerina pin doll for the Christmas holidays! The Pattern below is a template, make one from freezer paper. Cut out and iron onto muslin fabric. Stitch around the edges of the freezer paper. Make a slit in the center back about 3/4" long and turn RSO, stuff and slip stitch closed. Paint the bodysuit as indicated on the pattern. Let dry! Paint on the shoes and let dry! Coat the body and legs with clear glitter paint, then the arms for gloves and let dry. Glue a small piece of ruffled lace or fabric at the waist for tutu. Apply hair, paint the face and attach a pin.